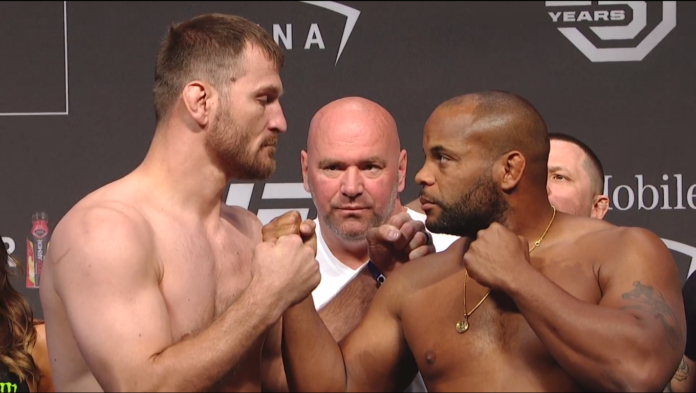 Stipe Miocic continues to push for a rematch with Ultimate Fighting Championship (UFC) heavyweight title holder Daniel Cormier. Back in July 2018, Cormier challenged Miocic for the heavyweight gold at UFC 226. “DC” knocked out Miocic in the first round to become a two-division champion. Since that fight, Miocic has been calling for a rematch. After all, Miocic did break the record for most successful heavyweight title defenses in UFC history.
.@dc_mma March 20 is coming up quick. Let’s settle this and get this fight on the books before you blow the candles out on that cake. Cormier is coming off a successful title defense against Derrick Lewis at UFC 230 back in November. “DC” locked in a rear-naked choke to force the tap in the second round. Miocic hasn’t fought since the knockout loss to Cormier. The question of whether or not Brock Lesnar remains in play lingers. The stage appeared to be set for Cormier vs. Lesnar when Lesnar shoved “DC” post-UFC 226. Since that time, Dana White has made it clear that the UFC machine waits for no one and that Lesnar will call him if he wants the fight. Do you think we’ll get to see Daniel Cormier vs. Stipe Miocic II?